Hello Everyone welcome to my blog. Today Susan’s Garden Design Team has their very first challenge. Our first challenge is to create a card / project that includes one or more of Susan’s Garden flowers. Susan Tiereny-Cockburn designs flower dies that are realistic and to scale as those flowers found in nature. Be sure to visit Elizabeth Craft Designs blog to see all the great creations our design team has created. 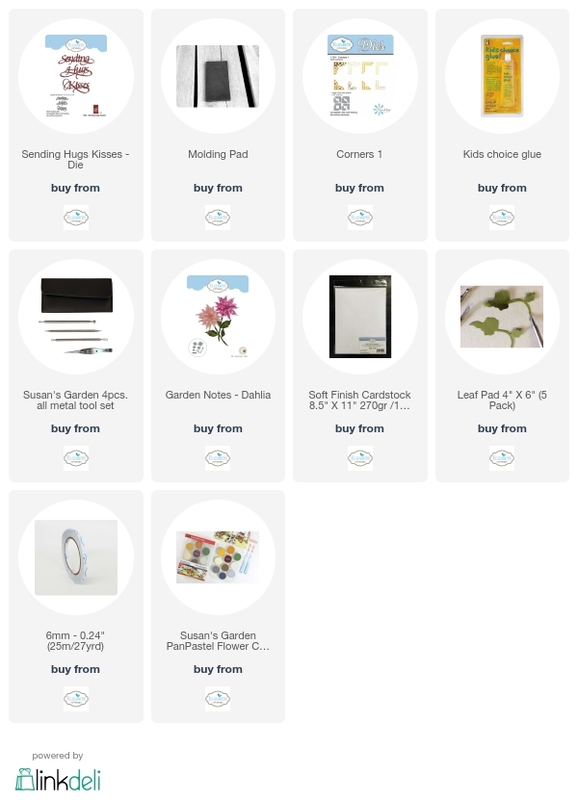 For today’s challenge Elizabeth Craft Designs are giving away a Susan’s Garden Prize Pack which includes: Garden Notes Square Window & Flower Box, Sunflower 2 and an All Metal Tool Kit to 3 winners. The winners will be announced on Friday, July 14 on the Elizabeth Craft Designs blog. For this challenge I have chosen one of Susan’s newly released dies – Garden Notes Dahlia. I love making the Dahlia as they come in so many different colors. Card base is 5″ X 7″ – cut white Soft Finish Cardstock 7″ X 10″ score at 5″ fold on score line. Cut patterned paper (yellow here) 6-3/4″ X 4-3/4″ adhere to card front using Clear Double Sided Adhesive. Cut white Soft Finish Cardstock 6-1/4″ X 4-1/4″ adhere to card front. Cut black shiny cardstock 3-3/4″ X 5-3/4″ adhere to card front. Cut white Soft Finish Cardstock 4″ X 10″ adhere Clear Double Sided Adhesive to the back of cardstock. Using Suzanne Cannon’s Sending Hugs Kisses die set cut Sending Hugs twice and cut 4 corners using Els van de Burgt Studio Corners 1 die set. Adhere corners to black shiny cardstock. Adhere the 2 sets of words together to give more dimension adhere to card front. Create Dahlia by using white Soft Finish Cardstock cutting each petal twice except for smallest petal and center cut them once. Shade center of all using yellow PanPastels Set 3. Shape petals assemble using Kids Choice Glue off setting each layer a little. (Susan has stepped this out on her blog stierneyc.wordpress.com . Cut several leaves from green cardstock shade and shape. Attach Dahlia and leaves to card front using Kids Choice Glue. Hope you have enjoyed my project today and until next time – Happy Crafting! Aren’t these fun to create? Thanks for sharing. Oh yes I do love making these are they are so realistic! Christine, this card is stunning! Thank you for the kind words. I love your dies and keep trying to buy a few at a time – love your stamps as well but have not purchased any yet. Thank you Ingrid for your kind words. I think we have quite a great Design Team!